Lusso means “luxury” in Italian. This luxurious Cabernet Sauvignon contains fruit from the St. Helena Appellation of Napa Valley and is 100% Estate Grown. Lusso comes from the best grapes we grow. This wine has aromas of black licorice, nutmeg, and red currant with hints of mocha and cherry concluding with a velvet-like texture and silky finish. Aged 27 months on new French Oak this wine showcases flavors of blackberries, vanilla and espresso. This handcrafted Cabernet lingers on your palate long after the wine has left your glass. A youthful and exuberant purple hue offers classic Cabernet aromas of cassis, cocoa and brambly black cherries. It shows full and dense with a sweet core of fruit on the palate. The textures of new, soft leather with aromas of forest floor, black cherry, baking spices, olive and persimmons cascade into a bright, long and lingering finish. 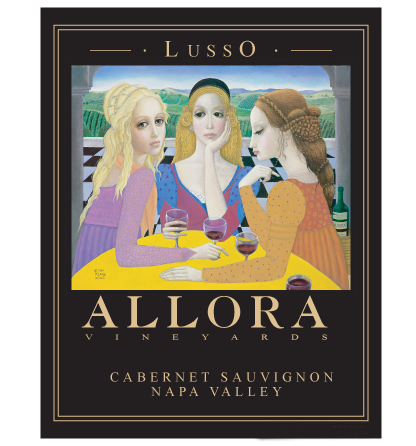 This Lusso is full of ripe blackberries, chocolate, black cherry and caramel and pairs well with dark chocolates. We recommend you pair it with your favorite meal during the next special occasion. Lusso in Italian means luxuxry and this is our most luxurious wine. It is barrel fermented with natural or wild yeasts made watched very closely during the entire fermentation process. From the time you smell it?s delicious fragrance, to the moment you savour the very last, luscious drop, you will be taken in by the rich texture and un-matched elegance of balance and refinement. This ripe, yet elegant wine has a dark, ruby color and a complex nose of cassis and nutmeg. On the palate, the wine has a delectable berry-laden entry and a rich, mouthcoating mid-palate. A seamless wine that expresses bright, fresh fruit characters from an unusually cool California vintage. It has a vibrant, ruby color and a complex nose of boysenberries, blueberries, sage, licorice. A luscious mouthfeel with notes of fresh fruit and carnation flowers on the palate. It has fine-grained tannins and a velvety texture that leads to a long, fruit-filled finish. The unpredictable growing season began with a series of early heat spikes in March, followed by the wettest April on record while a long cool summer allowed fruit flavors to increase beautifully.